Rev. Robert J. Renison served as rector of St. Paul’s from 1932 (after serving briefly as Bishop of Athabasca) to 1943, when he was elected to be Bishop of Moosonee. He was happy to return to the missionary life. The Diocese of Moosonee was a northern diocese covering a vast expanse of land. (350,000 square miles) He was elected Bishop of Moosonee to replace Bishop John Anderson, who was elected bishop in 1909 while Robert J. Renison was still a missionary in Moose Factory. Still, it was a change from the big city, and Bishop and Mrs. Renison continued to worry about their two sons who were still fighting overseas during World War II. In addition to his work as Bishop, Renison continued writing his column for the Globe and Mail. 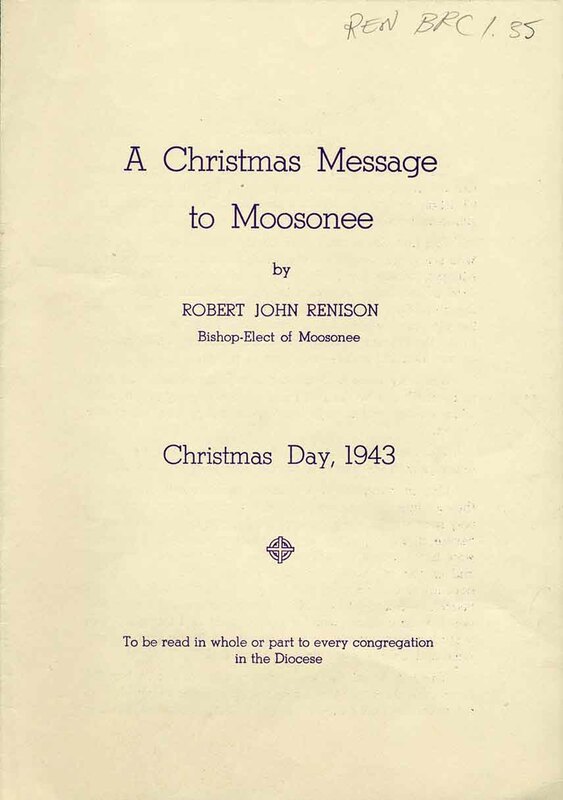 “A Christmas Message to Moosonee 1943”. This is a booklet Robert J. Renison wrote for the parishioners in the Diocese of Moosonee, just prior to leaving Toronto to become the bishop of the Diocese. He left Toronto on January 1, 1944 to become Bishop of Moosonee and retired as Bishop of Moosonee and as Metropolitan of Ontario in September 1954. “Bishopstope” was the See house of the Diocese of Moosonee. It is on the Porcupine Highway between the town of Schumacher and the town (now city, as of 1973) of Timmins, where the Cathedral is now situated. Bishop Renison writes “Its name is derived from the name given by miners to the area from which the ore is removed from underground, and it is a tribute to the mining men and other friends who offered to build one wild bishop a home. 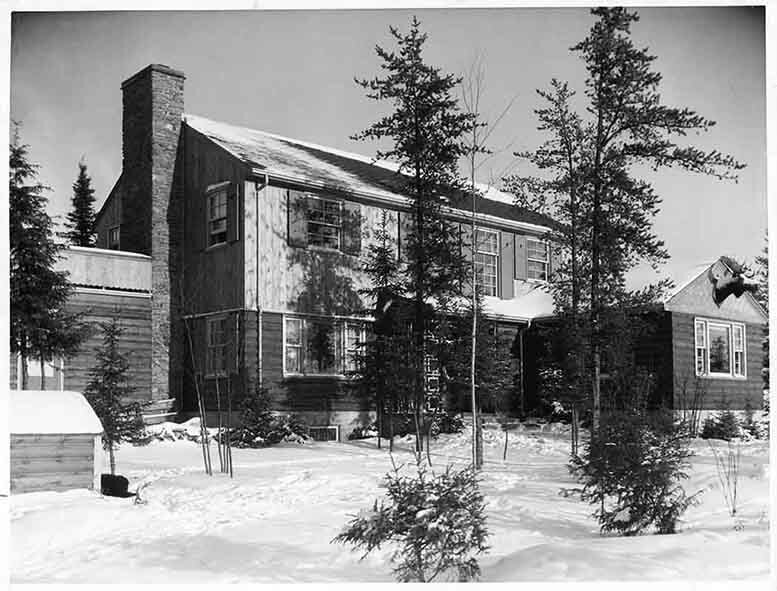 When finished it was deeded to the Diocese of Moosonee free of cost.” Bishopstope was built for Bishop and Mrs. Renison, as he had given the old See house in Cochrane to the Holy Trinity Parish there, and was built on five acres of the Coniaurum mines. This is a picture of parishioners at St. Mark’s in Iroquois Falls Ontario. St. Mark’s, which is a parish in the Diocese of Moosonee, was founded in 1912 with the building constructed in 1917 in what was then called Assonville. Iroquois Falls is along the banks of the Abitibi River and takes it names from nearby waterfalls. Iroquois Falls main industry was pulp and paper. Iroquois Falls started as a company town for the Abitibi Power & Paper Co. in 1915. This is a beached whale. Bishop Renison spent much of his time in the priesthood ministering to First Nations communities in the north, both in Northern Alberta and most particularly in Northern Ontario. 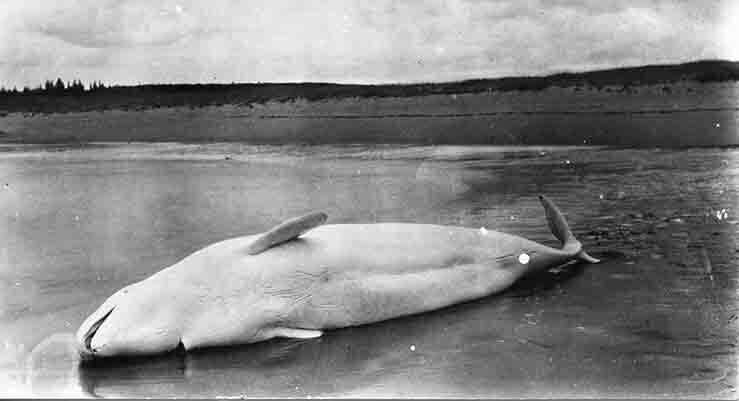 Whale hunting was common amongst some First Nations as a source of food, fuel, and light. This picture is most likely from the James Bay region in Northern Ontario. Mrs. Renison took most of the family pictures. Mines in the Northern Ontario region of the Canadian Shield produced nickel, silver, gold, lead, and zinc. The discovery of valuable minerals in the Canadian Shield led to the growth or rapid development of towns such as Cochrane, Sudbury, and Timmins (formerly Porcupine). 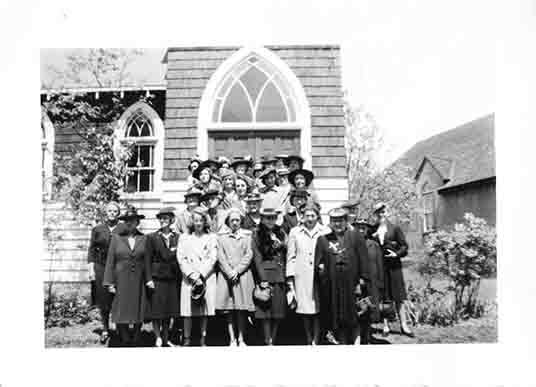 Mining played a significant role in the migration of Canadians from southern Ontario moving to the north, and, as a result, played a big role in the growth and financial development of the Anglican Diocese of Moosonee. Because mining had moved the centre of the action of the Diocese from Cochrane to closer to Timmins, Bishop Renison decided that the Cathedral (and See House) should be in Timmins as opposed to Cochrane. 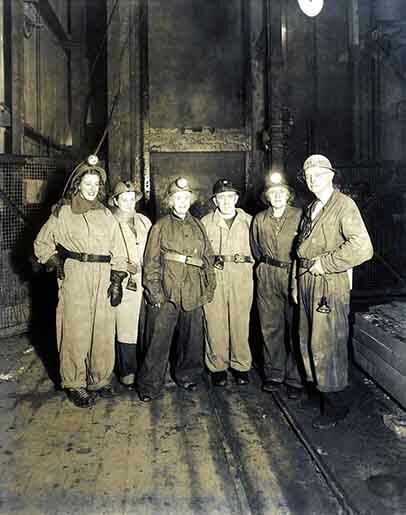 This is a picture of Bishop and Mrs. Renison visiting a mine, likely in Timmins, as Timmins is one of the larger mining centres in the Diocese of Moosonee. This is a photograph of Mrs. Renison and other clergy wives at Lambeth Palace, the palace of the Archbishop of Canterbury in London, UK. 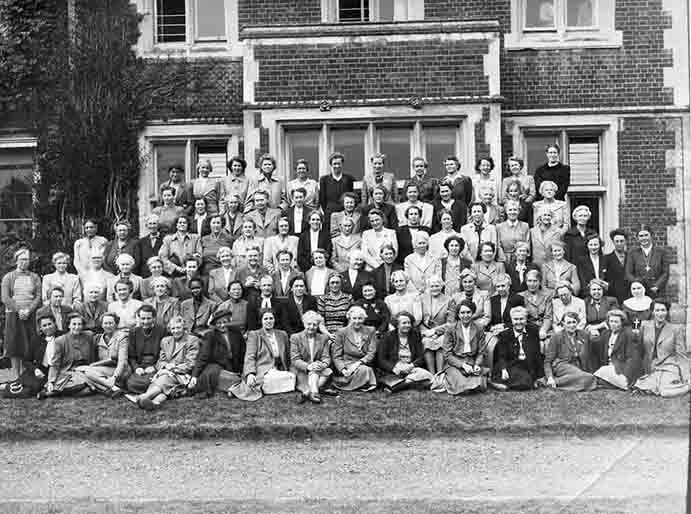 The Renisons were at Lambeth Palace in 1948 to attend the Lambeth Conference, a gathering of all bishops in the Anglican Communion, held every 10 years. The first conference was held in 1867.